What about Cathy Dobson’s performance did you like? The narrator is certainly a gifted linguist, and able to reproduce seemingly authentic accents from a variety of European languages. There are two drawbacks to her narration. The first is that her British accent is so refined that at times it comes across as affected. The second is that a British accent just cannot do justice to Mark Twain, the quintessential American storyteller! These aside, I would still purchase another audiobook with Dobson as the reader. The collection is a bit unbalanced toward Poe and Twain. I would have liked to have seen a greater variety, including Kafka, Bradbury, and Borges. All in all, though, I had never read most of the stories and enjoyed the selections. The accent of the narrator can be difficult at times, but it didn't significantly detract from my enjoyment at all; the quantity and quality are phenomenal considering this is just 1 credit. 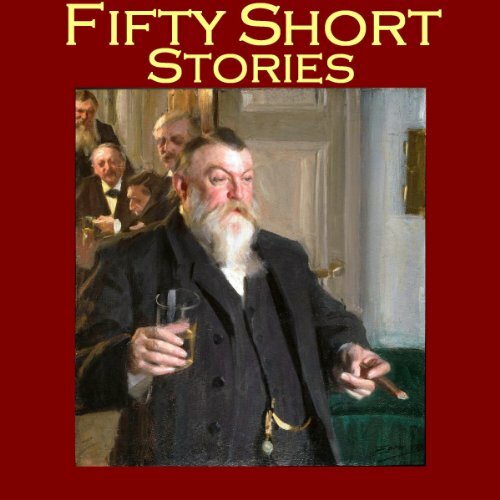 What did you love best about Fifty Short Stories? The variety of style, theme, and setting make this collection a constantly fascinating delight, only surpassed by the delight of the lovely narration by Cathy Dobson. It's hard for me to choose between the absurd characters of Ambrose Bierce, the hilarious and lovable ones of Mark Twain, the shocking Poe protagonists, etc. but because I had never read W.W. Jacobs before, I was especially charmed by his stories. Cathy Dobson's talent for lovely clear enunciation includes accurate accents and the perfect amount of differentiation between characters' voices, and she reads with an understated sense of humor and enjoyment that is contagious. This audiobook has no meaningful table of contents. There are 50 short stories but the ToC has 57 chapters, each named in the enlightening fashion of "Chapter 1, Chapter 2... If you are in the mood for a particular story, good luck finding it. I went in to the publisher's description on audible.com, copied/pasted the list of stories into Word, added automatic numbering to the list and printed it out in order to have some idea of how to find an author/story. Even this isn't foolproof, since for example, story #47 is on chapter 54. As this is a book of short stories, I do not want to be forced to listen in the publisher's order, but wish to be able to select what to hear based on mood, time available, and family members present. The narration is okay - not to my taste, but not bad. Cathy Dobson has a clear voice but a hypnotic rhythm. This makes it easy to become distracted. The stories, while all by famous classic authors, are somewhat repetitive in theme (what I have listened to so far, that is). I was only familiar with some of the stories prior to purchase, and the publisher's description consists only of a list of titles/authors, with no hint as to a central theme. Had I realized that so many stories consisted of the dispassionate narration of characters killing and/or torturing other people/creatures without remorse, I would not have purchased this for my family read-aloud time.